I might be a bike enthusiast but I never imagined a motorcycle deity at a temple. 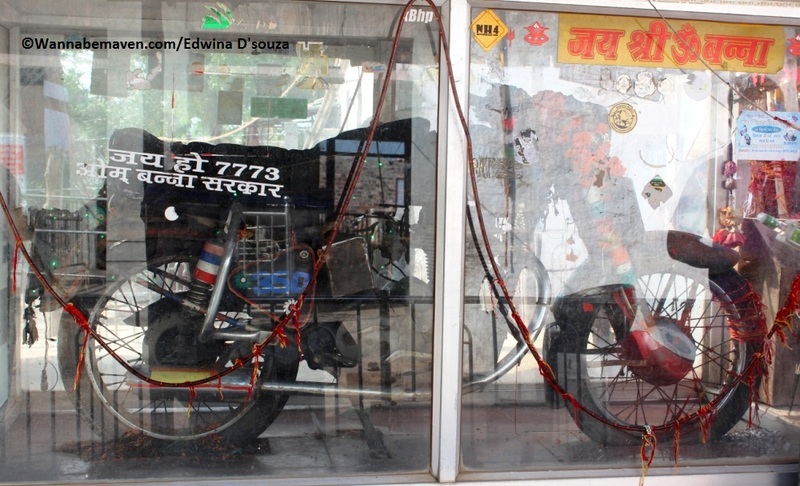 A small village in the Pali district of Rajasthan has a shrine where the deity is a Royal Enfield 350cc. Wonder how much pride the motorcycle brand must take! Back in 1988, Om Singh Rathore was riding his Royal Enfield in the Chotila village – Pali district, when he hit a tree, fell in a ditch and died on the spot. During investigation, the local police took his bike to the police station. But the bike appeared at the accident spot the next day under mysterious circumstances. The cops brought back the bike to the police station, emptied its fuel tank and chained the vehicle. But the next day, the bike appeared once again at the accident spot. This happened over couple of days. When the locals came to know about the incident, they were convinced that there was a divine power behind it. 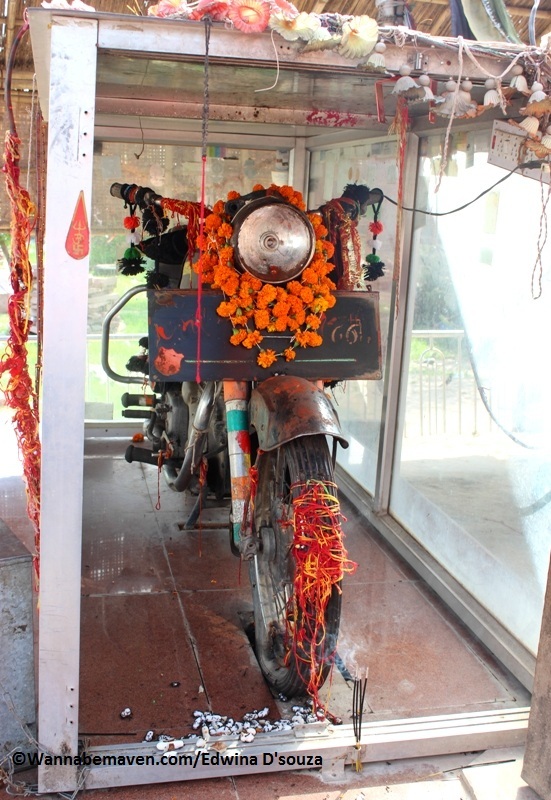 A shrine was then built for the Royal Enfield and its owner. The temple is named after ‘Om Singh’. 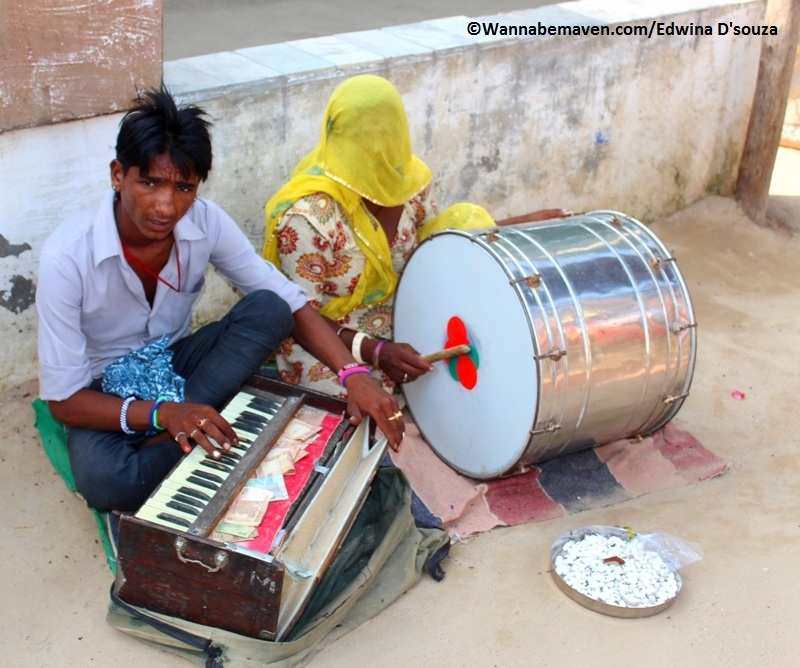 Banna is a common term among the Rajputs of Rajasthan to address a boy or a newly-wed groom. Over time, the Om Banna temple also came to be known as the Bullet Baba Temple. It is evident that Om Banna is a made up God. But the shrine is quite like any other temple, both in terms of belief and commercialization. The popularity of the Om Banna Temple can be gauged from the fact that the temple has had to shift its location right by the highway to a few meters away from the highway due to increasing number of visitors. Believe it or not, the bullet baba temple has a full time priest. Om Banna and the Royal Enfield are covered in plentiful garlands on any given day. People tie red threads to the bike and to the tree that caused the accident. Bangles are tucked to the wooden frames of the shrine and donation boxes are placed for those who would like to make offerings. Like most of the temples, one has to remove their footwear before entering the temple. And I even got put a tilak of red powder and ash on my forehead. Locals sing folk songs in honour of Om Banna and one can make small amounts of cash offering to them if they wish. Outside the temple, one can even find shops selling commercial items such as photo frames, bangles, scarfs and toys. 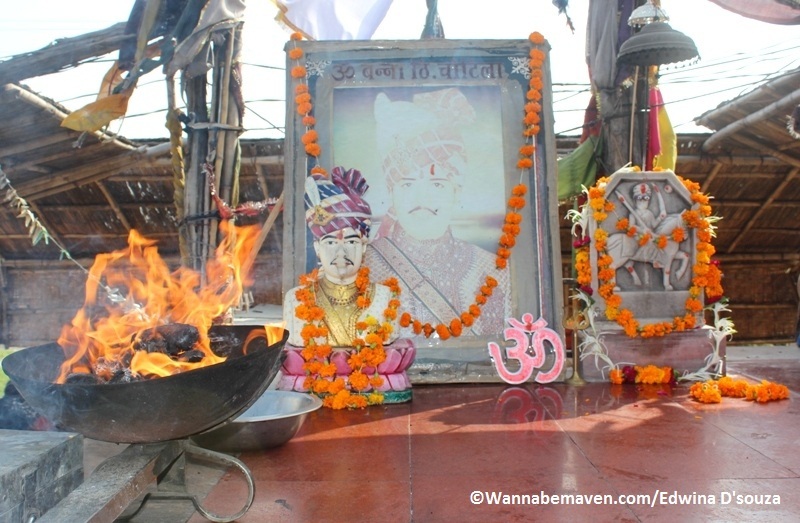 There is a belief among the locals that one must pray to Om Banna for a safe trip before they embark on their journey. 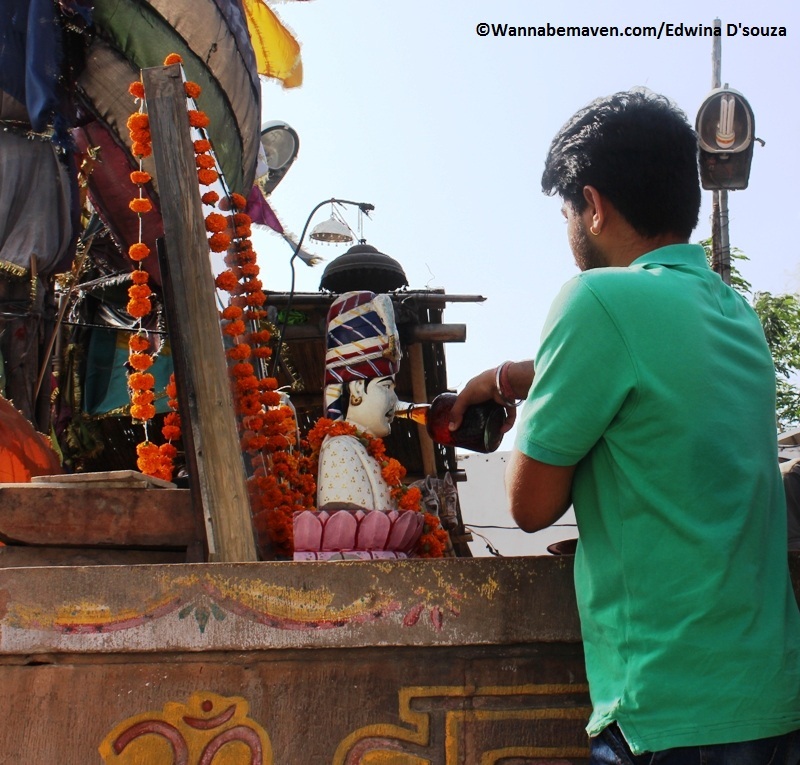 Even the location of the temple on the National Highway 65, makes for a quick halt for driving passersby wanting to pray and take blessings before they head onwards. The locals believe that those who do not do so are likely to have a dangerous journey. The Royal Enfield bike is encased in a glass box. 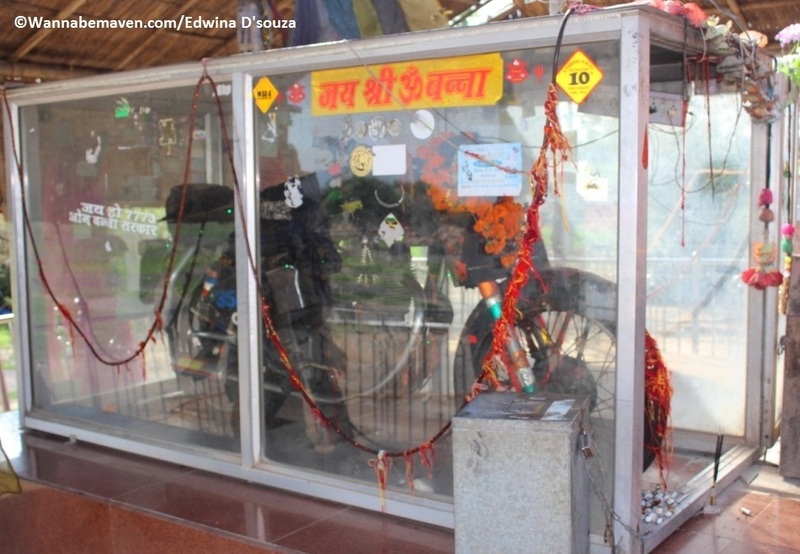 It is further believed that visitors must take two rounds of the encased motorbike while offering prayers. What caught my striking attention was the sight of devotees offering alcohol to the bust of Om Banna. Believers of Om Banna make a wish at the temple and return on fulfillment to offer Om Banna a bottle of alcohol. Surely, one weird ritual! The Om Banna temple is for the curious traveler who hasn’t quite seen anything like this before. Others might find travelling a stretch of 50kms for a visit to a mere temple of a made up deity not as much worth it. The Om Banna Temple or Bullet Baba is located on the National Highway 65 in the Chotila village – Rohat between Jodhpur and Pali. Biggest commercial and tourist city is Jodhpur, 50kms away. Travel Tip: I would recommend visiting Om Banna Temple as a side trip while exploring Jodhpur. Culture, Faith and Belief, Folklore, Jodhpur, Offbeat, Religion, Rituals, Royal Enfield, Temples, Travel, unique cultures. Bookmark.